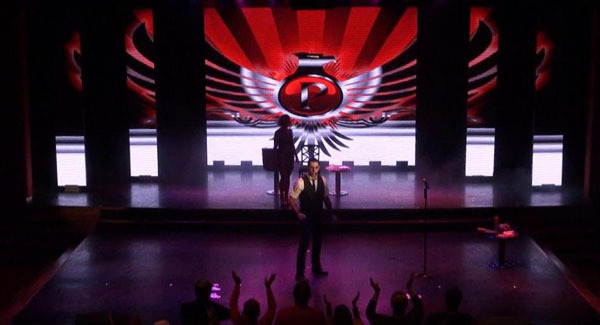 Mentalist Phoenix has stunned audiences on 17 cruise ships spanning across 9 different cruise lines and has one of the highest rating mentalist and magical acts for a guest entertainer at sea. For years audiences have been proclaiming, “Phoenix is amazing!” and “How does he do that?”. Mentalist Phoenix experience performing within the cruise industry began 13 years ago. His mentalist performances have been leaving audience members amazed ever since. Phoenix attributes include amazing talent and absolute magical warmth that emanates from the stage to each member of his audience. He captivates people every where he goes and is certain to thrill and amaze your on board guests with his psychological entertainment style. Phoenix loves to travel and as a result he has developed a variety of show types especially for cruise audiences. Cruise directors have commented more times than not, that these shows are “exceptional” & that other mentalists seem to be boring in comparison. Mentalist Phoenix has the ability to ‘Wow’ a crowd. His mentalist skills aside, Phoenix is a fabulous performer possessing amazing stage presence in addition to a genuine understanding of cruise industry entertainment, easily builds rapport with audiences, and the marks of an accomplished showman. Versatility is the key to successfully performing at sea, and it is for this reason that Phoenix’s shows are offered in a variety of ways. There are two main 50 minute shows that can be performed, & an optional hypnosis show. The most dazzling show is the “Mind, Myth & Magic” show, complete with Phoenix’s signature water tank escape finale. The water tank is not as large as one might expect & quite easily loads onto ships. The remainder of the show is a mind-bending ride that will dazzle any audience. This show, when performed in full, always has crowds on their feet. For occasions of which it is necessary to fly Phoenix on board for shorter stints or portions of an itinerary, a fly-on version was created. This obviously does not include the water tank finale, however, this show still receives amazing reviews, & has guests talking for days after the performance. The second show is simply named “Mentalist” & is a crowd pleasing adventure into the incredible. On cruise lines where only one show is required, the water tank can be the finale of either show. For cruises of which both shows are required, the water tank escape is recommended as the finale to this show. Neither show absolutely requires the water tank escape finale, as they were designed to be able to fly-on/off if required, but for incredible reviews, standing ovations, & cruise critic ratings, the tank certainly adds to the awe for the audience. Both Mentalist shows are unlike any other so we are more than happy to be booked along with another Magician or magic show. There is no chance of Phoenix’s show being similar to another magic act. Phoenix’s “Mentalist” shows are psychological entertainment at it’s finest! Further to these two shows is Phoenix’s Hypnosis show. A comedy stage show of which we need not explain as it is somewhat self explanatory. Great volunteers enjoying the finnier side of mind reading. Unlike many other guest entertainers, Phoenix also offers a workshop/lecture. After noting so many guests asking Phoenix how he remembers such incredible amounts of data, Phoenix composed a “Memory Workshop” for guests on board. This workshop turned out to be far more popular than anticipated & now often packs out the show lounges & theaters with guests eager to learn, all of which singing praise by the end of the experience. Appeal to all ages? Absolutely! Whilst Phoenix performs some mind-boggling routines, it goes without saying that another key to successful cruise entertainment is to be able to entertain a variety of age groups. On cruises of which higher numbers of families are cruising, Phoenix will include additional routines that audiences of ALL ages will enjoy, whilst niche cruises that are generally child-free will be tailored to that particular market. Upon arriving on each ship, Phoenix will ask after demographics & groups cruising. It also never hurts to make a guest appearance at the kids club to perform a routine or two either! Entertaining off-stage is always the case. Everywhere around a ship is a stage. Some cruise lines encourage dining & meeting guests, & while doing so, Phoenix will often demonstrate his psychological mind reading, giving those lucky guests an even more personalized cruising experience. It is this goal for high ratings & great comments that has taken Phoenix around the globe on both the world’s largest, & only 6 star cruises. Phoenix created a pre-show video of interactive scenes & videos of previous television appearances. Not only does this create rapport with the crowd, but entertains them as they wait for the show to begin. The shows have evolved even further since the below video was created, however, it will give any prospective cruise lines an insight into what Phoenix offers.